North west sligo here was crazy last night I have never heard of felt anything like it. My brother in laws sheds were hit. Amazing reports from overnight . More to come tonight / tomorrow perhaps but hard to beat last night. North Clare at 4am was ground shaking and lit up like morning time. Especially in the village of Corofin, I live on the edge of it. It was like the thunder and lightning you'd see in the movies. A really angry thunder storm. unreal last night never seen anything like it. at times it was less than counting to 1 and boom then lightning. the poor dog was barking at it and at the same time shivering with fear. I woke up at either 3:55 or 4:55 in Galway City(maybe just by chance as I had a few drinks and wake a lot during the night) and the first Thunder I heard 30 seconds later was so loud I doubt it didn't wake everyone around. It must have been right over head, closer than it ever was. Loads of lightening and thunder followed but that first one that came alone was something I'll never forget. Reminded me of that video from a few years back where the fireworks factory blew up in China, the one the Americans filmed from the hotel. The explosion that made them run. Its funny because its exactly what I was thinking of too, even the guys reaction of "NO F***ING WAY!" Can you imagine if this storm hit Dublin it would be headlines ,according to local radio the are hundreds of homes with no power and the ESB said the number is rising. 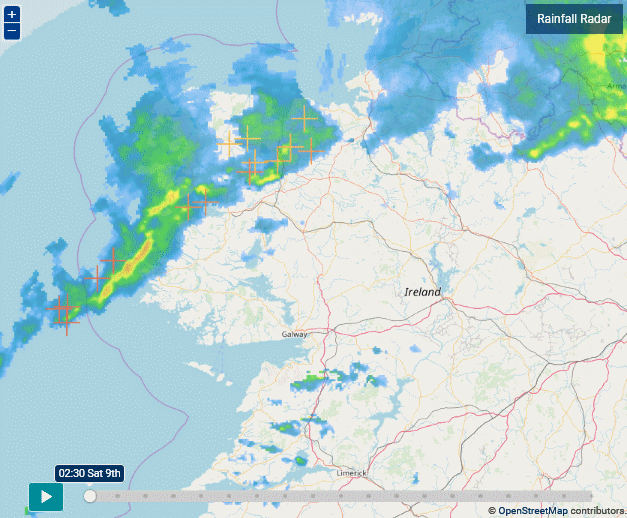 Radar sequence (met eireann) for between about 2.30 and 4.00am last night. I didn't get to catch anything image before or after that as was grogged out with sleep. I have mentioned this before, but it was a phenomena that occurred last night also, in that the sound of approaching thunder at this time of year seems oddly ominous and eerie. Even when the storm was miles away, the ultra-deep bass of the booms, which lingered for up to a minute, could be 'felt' as much as heard. I have never been woken by a thunder storm in my life as I'm a heavy sleeper. I've in the past been disappointed for missing a late night electrical storm when other ppl in the house heard it. But last night in Castlebar I woke due to the most tremendous clap of thunder that I though the next door building had collapsed. Never heard anything like it, extraordinary.